Cleaning the gutters is a dirty and dangerous job but somebody has to do it. Let the somebody be the iRobot Looj 330 Gutter Cleaning Robot instead of you. Designed by iRobot, the same folks who brought to you the highly popular iRobot Roomba, the iRobot Looj cleans your gutter by blowing away leaves and other debris that clogs up your gutters while brushing it with a high velocity brush that spins at 500 RPM. A four-stage auger breaks up the clogs and throws them off your roof. Sweepers and a scraper then clear the remaining debris from the gutters. The iRobot Looj does all this without having you to continuously climb up and down the ladder to clean up sections of your gutter. You no longer have to endanger yourself by over reaching while perched high up on the ladder. Clean up to 30 feet of gutter in just 5 minutes with the Looj. The iRobot Looj will move along the gutter on its own and it has sensors to detect the debris. It will adjust its cleaning accordingly to ensure that the gutters are properly cleaned. The Looj robot can either operate manually or in the automatic CLEAN mode. You can have full control over the robot in manual mode using the included remote control. 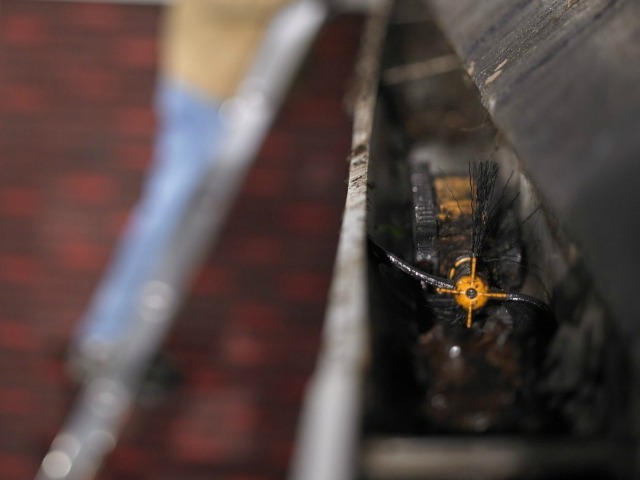 In the CLEAN mode, the robot travels through the gutter on its own using its built-in sensors. The built-in Lithium Ion battery provides enough power to clean up to 200 feet of gutter on a full charge. The iRobot Looj is also waterproof so it has no problems with removing wet leaves and debris. It also can be easily cleaned by hosing down the robot once it is done. The iRobot Looj 330 Gutter Cleaning Robot autonomously blasts away dirt and brushes gutters clean at the press of a button.